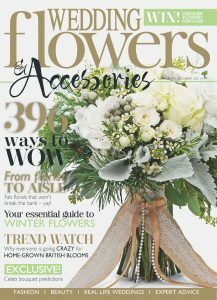 We were delighted to be included in the Wedding Flowers & Accessories Magazine, ‘Note book’ section for November and December 2016! We were asked to construct a bridal bouquet, Table centre and Accessory for a wedding, in the colour peach, we did this gorgeous deconstructed bouquet below, with silvery foliages, ferns, Garden and Standard Roses, Dahlias, Astilbe and Scabiosa Pods. 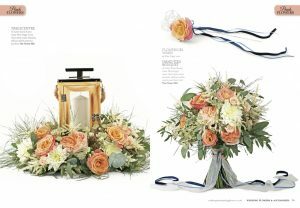 Our table centre was a rustic square lantern surrounded with a mass of flowers along with a flower girl wand with navy accents.